ANNOUNCING YOUR PREGNANCY: Congratulations on the big news! Whether it's your first child or your seventh, letting people know that you're pregnant can be an exciting time. 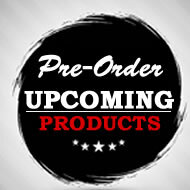 Having an interactive announcement will get your loved ones even more excited about your news. 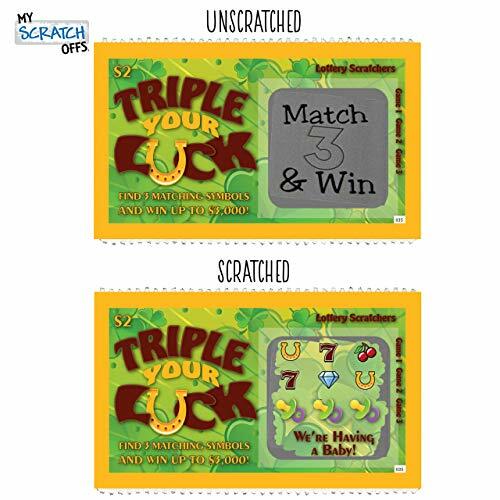 Our classy scratch-off jackpot cards are the perfect way to let family and friends know that you're expecting. 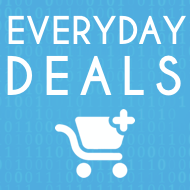 5 JACKPOT CARDS: Each scratch-off card is an eye-catching color. 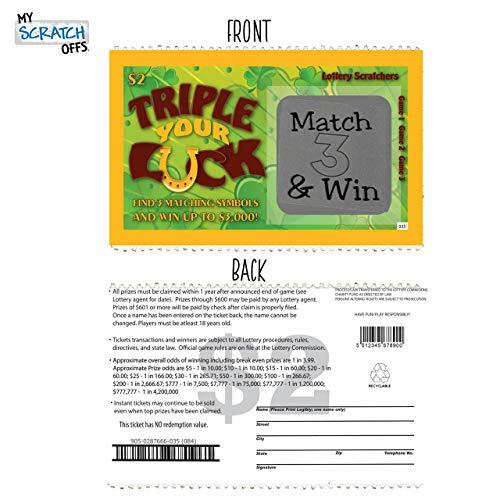 When your loved ones scratch off the box that says "Match 3 & Win," it'll reveal your exciting secret! Beneath the scratch-off section, the card shows 3 rows of lottery symbols, the last row being a row of pacifiers. Underneath the final row, it says "We're having a baby!." Congrats on your exciting news! We know that it can be difficult to plan a creative pregnancy announcement that people of all ages will enjoy. To make planning your big reveal a breeze, we created high-quality scratch-off cards that both grandparents and toddlers will love! 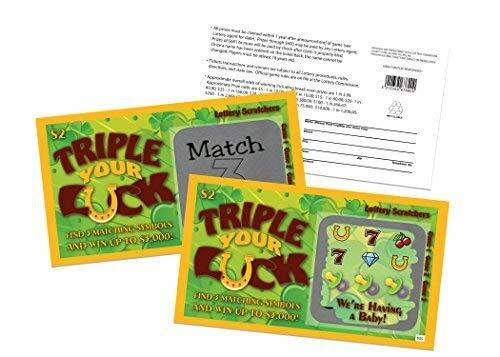 This scratch-off set is sure to bring a smile to the face of each family member and friend that finds out your big news. Each set comes with 5 lottery ticket cards that are 2" x 3.5". 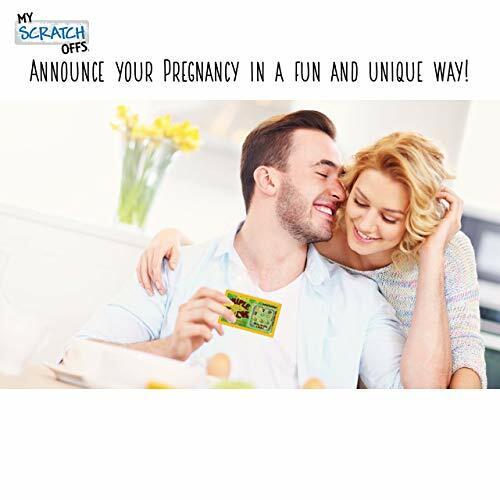 Unlike ordinary pregnancy reveal gimmicks, this fun scratch-off activity does not require your guests to sit down and be quiet, interrupting the flow of the event. Simply hand out the cards and give your guests something to use as a scratcher tool. 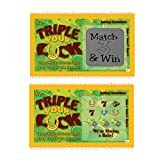 When the time comes, have everyone scratch off the silver film that is covering their lotto board and the big surprise underneath them. Once the hidden message has been revealed, new dads, grandparents, aunts, and uncles will be ecstatic! 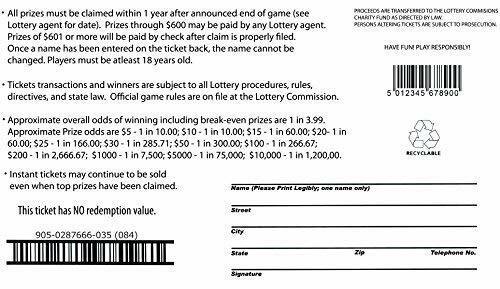 Unlike tacky scratch-off cards, our gag lotto ticket looks authentic and is printed on quality paper. Underneath the scratch-off surface, there are 3 rows of common lottery images, including cherries, horseshoes, and diamonds. Under the 3 rows the words "We're having a baby!" 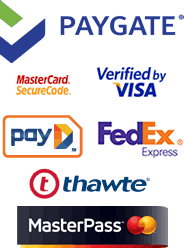 are in exciting bolded letters that you can't miss. 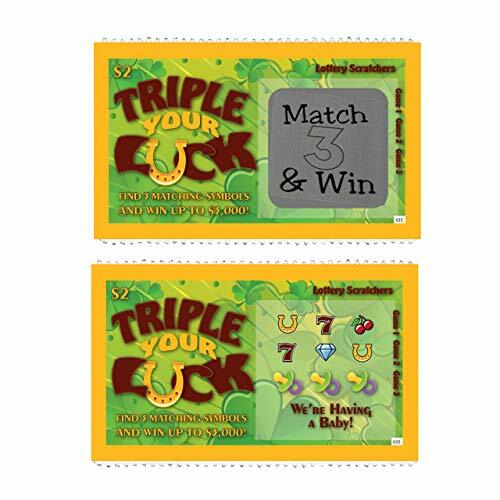 Scratch-offs are a fun way to get everyone involved and can easily be scratched with a coin. Whether this is your first child or your fifth, you'll love this creative way to announce the good news! Get a 5-pack of our lottery-themed baby announcements from My Scratch Offs today!